Fighting games have a tutorial problem. With such a wealth of information to dispense, too many either overwhelm newcomers or tell them nothing at all. It's a genre that has become too complex for its own good: you can jump in, press a few buttons and have a good time, but one look at what your opponent is doing shows how little you know. 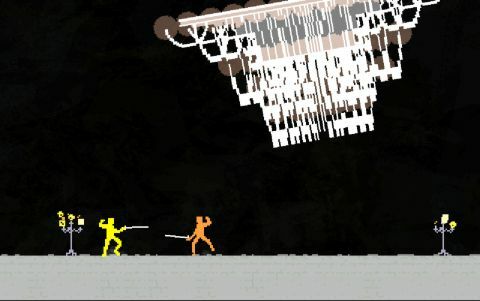 In Nidhogg, you can jump in, press a few buttons and have a good time, too. But when you look at what your foe's doing you don't get disheartened. You learn something. It begins with two pixellated swordsmen in a single room. One button attacks; the other jumps. When the first blow is landed you learn this is a game where one hit kills, and at the top of the screen appears an arrow and a single word. Go. You race off accordingly and learn that your foe respawns further back. Pass him and it transpires that Nidhogg's stages span five rooms, two either side of that central starting point, the winner the player who reaches the far end first. You see your opponent switch their sword between three different heights. You try the input that makes sense - taps of up or down on the controller - and it works. It's a recurring theme: you instinctively press up and attack to mimic an opponent's sword throw. You tap down and pick up a sword left behind by an earlier spawn. You wall-run, you sweep, you spine-rip your grounded opponent, and you do them all without even thinking about it. Within an hour you'll have seen all Nidhogg has to offer. You'll have heard Daedelus' marvellous electronic soundtrack. You'll have seen all four very different stages: the tense, near-invisible swordfights in the Wilds level's tall grass, and the low ceilings of the Mines, which kill the projectile game. And you'll have learned the entire moveset without a word of explanatory text. Yet that's only the beginning. Little details emerge and inform new strategies. Those three stances, for instance, are crucial. The highest blocks projectiles; the lowest is as good as unavoidable under low ceilings; the middle is the most useful for disarming a foe by moving your sword up or down toward an opponent's as they attack. This shared, sparse toolset affords a huge variety of playstyles: you can hang back and turtle, use sword throws like Hadokens, or simply leg it, the latter requiring that you discard your sword for the sake of faster movement. There's no time limit. One game might lasts seconds, the next half an hour, a joyous to-and-fro of victory snatched from the jaws of defeat with a well-placed sword throw, of frantic melee kills in the final few inches of a room. You can play online, and there's a decent singleplayer mode, too. But Nidhogg is first and foremost a local multiplayer game, made for two players sharing the same sofa space, jostling and laughing and shouting and revelling in playing what is surely the purest fighting game in years, and maybe even the best.